The U.S. educational pipeline functions well for some groups of students, allowing them to flow smoothly through the various levels of education and yielding a fairly proportionate number of high school and postsecondary graduates. The pipeline for Latina/o students, however, does not work in this way. 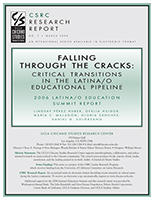 This report examines the research literature on critical transitions within each segment of the educational pipeline—K-12, community college, undergraduate, and graduate—and offers recommendations for policies that, if implemented, will increase the number of Latina/os who graduate with advanced degrees.